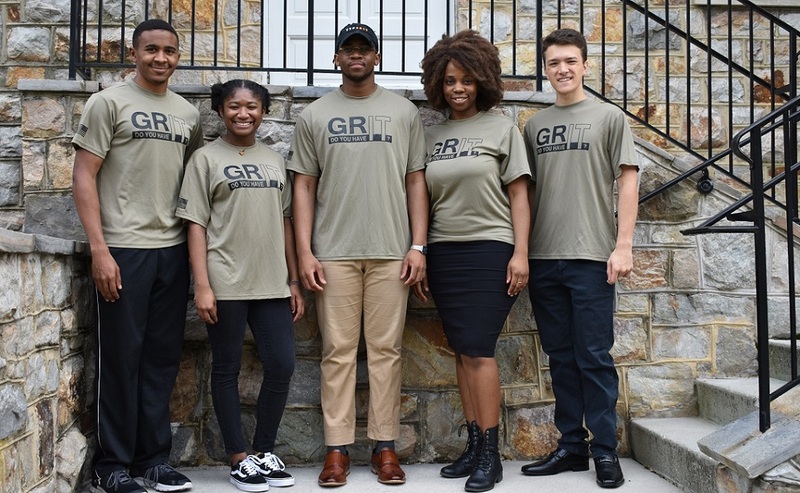 For sophomore Isaiah Williamson, the prestigious 34th Annual National Conference on Ethics in America at the United States Military Academy at West Point on October 16-17 was perfectly timed. Williamson, a track athlete, has begun training for decathlon, with grueling practices every day. The West Point program, which focused on grit, offered resources and support that will help Williamson possess the sense of duty and resiliency needed to accomplish decathlon training and other challenges. The track team begins every season watching Angela Duckworth’s classic 2013 TED Talk on grit. Williamson, a cybersecurity and psychology major, had the opportunity to tell conference keynote speaker Duckworth that the team’s training regimen is structured around her studies. Duckworth thanked Williamson for sharing this information and ended their encounter by telling him that she hopes they will meet again. Joining Williamson at West Point for two days of distinguished keynote speakers, small group discussions and networking were Sara Frouh, C’19, Michael Gunn, C’21, Harry Scherer, C’22 and Shahanaaz Soumah, C’22, along with West Point cadets and approximately 200 students from more than 30 colleges and universities. The five Mount students who participated in the conference will share their experiences and lead an interactive discussion on grit with the university community from 4:30 to 5:30 p.m. on November 27 in Library Room 102 of Phillips Library. Sara Frouh’s mother also needed grit to leave Cameroon for the United States. A biochemistry major who plans to go to medical school, Frouh spent two hours sharing everything that she learned at the conference with her mother. Frouh found inspiration in the keynote presentation by Captain Shaye Haver, one of the two first women to graduate from the U.S. Army Ranger School in 2015. The 61-day combat leadership course is considered to be the most physically and mentally demanding Army leadership school. “Everyone expected her to give up, but she saw 100 miles as one more step,” Frouh said. Frouh also valued the advice from various speakers that reflected her values: gratitude for what you have, positivity, and willingness to rely on your supporters for help when needed as well as to help others. Shahanaaz Soumah’s family also has roots in Western Africa. Soumah, a biology and French major, is the oldest of 10 children. Her family moved from Guinea to the United States before she was born so that she could receive the health care needed at birth to save her life. Soumah, a “people person,” sought to be as open as possible during the program and remains in touch with students she met from across the country. “The greatest part of the opportunity was gaining a big sister in Sara,” said Soumah. A philosophy, politics and economics major, Harry Scherer appreciated the different perspectives on and brands of leadership among the keynote speakers, including Dan Chung, CEO of Alger Financial; Charles Hunt of the Audacity Firm; Charlayne Hunter-Gault, the first to integrate the University of Georgia; and Adrianne Haslet, a Boston Marathon survivor. All five Mount students competed for travel scholarships for the conference by writing an essay on grit, and they all received the travel funding. “This engagement strongly manifests the Mount’s desire within its strategic plan to form ethical leaders who live lives of significance,” said Dana Larkin Sauers, director of the Institute for Leadership, Ethics, Achievement and Development (iLEAD), who served as the Mount’s liaison to the program. The students also have been invited by Kathleen Bands, Ph.D., director of the Organizational Leadership Doctoral Program at Hood College, to speak about grit at the neighboring college.